Southern Baptists came to New Orleans to make history, and history is what we made. The Southern Baptist Convention will forever be changed by the events of the New Orleans meeting, and the world will be watching to see if we really meant what we said as we elected Fred Luter as the first African American President of the Southern Baptist Convention. The following are my reflections on the 2012 Southern Baptist Convention and its meaning. 1. The importance of meeting in New Orleans. The Southern Baptist Convention came to New Orleans almost seven years after the city was devastated by Hurricane Katrina. This great historic city has been important to the Convention from its founding in 1845. One of our six SBC seminaries is located here, built upon the work established as the Baptist Bible Institute in the early twentieth century. 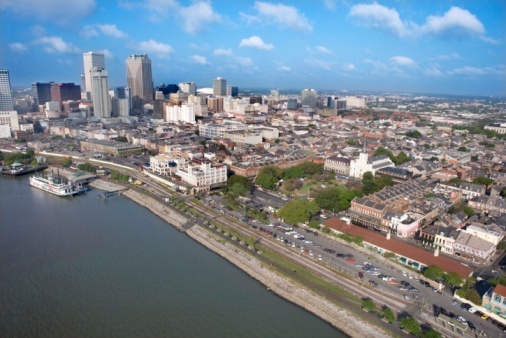 New Orleans Baptist Theological Seminary made an important commitment to the city of New Orleans in the aftermath of Katrina, and the seminary has a great witness within the city and far beyond. New Orleans is also where Southern Baptists were historically engaged in important hospital and charitable work, and much of that work continues still. Southern Baptists came by the thousands for the 2012 convention, and the city of New Orleans was a gracious host. Its people were incredibly friendly. For several days, the French Quarter was selling more ice cream than cocktails, but what the city suffered in alcohol sales it made up in meals sold. We came, we saw, we ate. 2. The importance of electing Fred Luter as President. Slavery was not the only precipitating issue for the formation of the Southern Baptist Convention, but it was the central issue. The SBC was forged in the bitter and humiliating defense of slavery and institutionalized racism. For more than a century beyond its founding, that institutionalized racism continued, with the majority of Southern Baptists resisting the Civil Rights movement. And yet, in 2012, that same convention elected an African-American man as its President. That action was a demonstration of God’s patience with His people, and it was a moment of unmerited grace for our denomination. Fred Luter is a man of great conviction, presence, and leadership. He has been tested by fire and found faithful. The respect of the entire Southern Baptist Convention is his, and he will lead well. The test ahead is for the Southern Baptist Convention. Even as twenty percent of our churches are now identified as ethic and minority, we still lag far behind the nation in terms of racial and ethnic diversity. The U.S. Census Bureau predicts that America will be a “majority minority” population by the year 2033, if not before. Southern Baptists will become a marginalized people holding to a quaint folk religion if we do not seize the moment and see racial and ethnic diversity as a gift, and not just a fact to which we have to reconcile ourselves. We leave New Orleans with great hope. 3. The importance of leadership. President Bryant Wright led with great grace and character. His calm and gracious personality was extended to the way he presided in the Convention’s sessions. It is virtually impossible to dislike Bryant Wright, and his grace and kindness in the sessions were great gifts. He was open, generous, and happy — traits that should characterize all Southern Baptists. Other leaders also served well, particularly Jimmy Scroggins, pastor of First Baptist Church in West Palm Beach, Florida, who provided stellar leadership for the Committee on Resolutions. He demonstrated statesmanship and mature confidence under pressure, and the Convention appreciated the hard work of his committee. 4. The importance of our name. The Southern Baptist Convention is not going to change its name — not this year and not anytime soon. The reasons for this are many and they are enduring. The motion adopted by the SBC in New Orleans allows churches to identify themselves as “Great Commission Baptists” without denying the SBC in any way. This will help churches that are not located in the South more than others, but the descriptor, “Great Commission Baptists” is worthy of our acceptance and eager use. It also establishes an identity we must now serve and fulfill. 5. The importance of doctrine. There have been meetings of the Southern Baptist Convention that, in theological terms, have been nothing less than determinative. The most recent of these was 2000, when Southern Baptists adopted a revised statement of “The Baptist Faith & Message,” our confession of faith. Other meetings of the Convention have been, at times, less explicitly theological. The 2012 SBC was marked by talk about theology, and the issue of Calvinism in particular. At this point, the reality is more like talking about talking about theology, but the talk will become more organized, partly through a process to be led by the SBC Executive Committee. In the meantime, Southern Baptists need to be kind, open, generous, and truthful. We should expect the best of each other, and extend understanding in every possible way. The three weeks prior to this year’s SBC did not find Southern Baptists at their best in terms of this kind of discussion, but we can and must have the right conversations in the right way. This conversation will marginalize those whose influence should be marginalized — those who have a party spirit, who play into tribalism, or who want to divide Southern Baptists from each other. We will stand within the “Baptist Faith & Message” and we will learn how to talk in a way that will help each other to be more faithful and biblical, not more hardened and bitter. 6. The importance of our mission. The Southern Baptist Convention was established for the purpose of reaching our nation and the nations of the world with the Gospel of Jesus Christ. The SBC dreams mission dreams and bleeds missionary theology. When the Convention’s messengers heard reports and testimonies of people coming to faith in Christ, their hearts quickened and their joy was evident. The SBC will instinctively gravitate to anything that serves the fulfillment of the Great Commission and the reaching of the nations. Messengers loved the reports of peoples reached and churches planted in the United States and around the world. If your heart does not resonate with that, you need to attend some other meeting, and join a church of some other denomination. 7. The importance of the total event. The Southern Baptist Convention is a two-day business meeting, but it is also a multi-day gathering of Southern Baptists, who meet for the Pastors Conference and a host of other meetings. Among my favorites was the Baptist21 luncheon on Tuesday, organized by a group of bright, creative, and convictional young Southern Baptist leaders. The panel discussion featured, among others, Dr. Paige Patterson talking about the importance of the Conservative Resurgence in the SBC. It was a worthy and important conversation, especially crucial since so many in that room had not even been born when the so-called “Battle for the Bible” was launched. The “9Marks at 9″ meetings Monday and Tuesday nights under the direction of Dr. Mark Dever also brought together a generation ready to be sent anywhere in the world. Their love for the SBC was as clear as the energy they are ready to deploy and the convictions they hold. 8. The importance of getting to work. Southern Baptists come to the annual meeting of the Southern Baptist Convention and then go home. The Southern Baptists who gathered in New Orleans this week will leave praying in a new way for the Baptist work in that great city and beyond. As we go back home, the real work begins anew. The annual meeting is both necessary and important, but the work of the Convention is not at the meeting, but out in our churches and on the fields of mission. Now is the time to get back to work, to celebrate the history made together in New Orleans, and to be determined to make it count. It is a new day in the Southern Baptist Convention, and we must be exceedingly thankful for the light of this new day. As we leave Louisiana, we will show the world if we will make the most of this opportunity, or let it pass and bear the judgment of God for our failure.